Have you wonder of how much time you've been taking to look for a high quality photoshop brush on the internet? The search engine might display lots of resources, but only few that included high quality of brushes inside the recommended website. I think this is the time for you to visit BrushKing.eu ;). 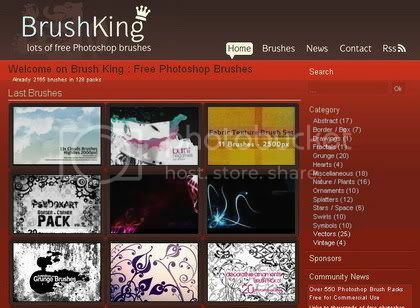 BrushKing.eu is a new website that collects great numbers of free Photoshop Brushes with quality. 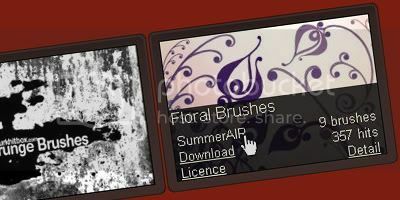 No need to be hassled to find what you're looking for when you visit the Brushes Gallery, because at the very right sidebar you will see how those brushes are nicely ordered into categories. You can navigate better by browsing the whole brushes that have been tagged using a search form. Featured Photoshop brushes by specific categories that get lots of attention are: Splatters, Swirls and Vectors. The collections of those three brush set categories are the most wanted stylish trends over the professional designers and blogers. While the community news section, allows you to submit one of your own articles or something that you appreciate from another blog (all related articles about brushes). Yet, BrushKing.eu has became more dynamic as a resourceful Photoshop brush set collections website, ever! Another amazing thing about BrushKing.eu is how easy you will get direct access information from an animated sliding tool tip when image thumbnail box of each brush set is hovered. You will see common infos about the brush's author, download link, brush set license, number of brushes in a set, download popularity counter and detail link, simply by going through pages of brushes gallery. BrushKing.eu has currently listed over 2000 brushes from great designers, so make sure that you won't miss the updates by subscribing to BrushKing.eu RSS Feed. Please tell us what you think about this website after your first visit or drop a testimonial comment of how BrushKing.eu collections have become such a helpful resource to your design project! Answering the first question on first parapgraph : Since I able using photoshop :D and I guess it's ... 4 years ? Thanks for da comment :) yes BrushKing.eu is my most favorite photoshop brush resources! Nice and thanks for your sharing ya!